I just found out that Peggy Jane Lehto, my second cousin once removed, died earlier this month on August 11, 2013. She was only fifty-seven years old. Her great-grandparents Mattias Nikolai Stuuri (1861-1922) and Walpori Wilhelmina Erkkila Stuuri (1860-1925) were my great-great-grandparents. Peggy was born on September 7, 1955, in Painesville, Lake County, Ohio, to Adrian Samuel Lehto (1924-2003) and Julia Kish Lehto. She married John Mercurio and had a daughter Elizabeth. Peggy and John divorced in 1997. Peggy was living in Sparks, Nevada, when she died. Her obituary says that she was employed as a customer service manager for Channel Publishing and as a shipping clerk for OHL Logistics in Reno, Nevada. I didn't know Peggy. In fact, I've never met her entire branch of the family back to her paternal grandmother Elizabeth Stuuri Lehto (1903-1982) as far as I know. But I offer my condolences to all of the family and to Peggy's friends. The Lehto family held a luncheon in Fairport Harbor, Ohio, last Saturday, August 24. The announcement of a memorial service for Peggy is still forthcoming. The Leifer Family, circa 1880. Click on photo to view it larger. ﻿﻿﻿﻿In this previous post about my Swiss ancestors, I commented on a photo of the Leifer family, which I estimated was taken about 1875. I proposed that the woman on the left is my great-great-great-grandmother Catherine Easley Leifer (1818-1892) and that the man she’s resting her hand on is my great-great-great-grandfather Frederick Leifer (1813-1865). But there’s a big problem with that proposal: Frederick Leifer was dead in 1875. He died in 1865. So unless he was stuffed, that guy sitting on the left can’t be him. The back of the photo has the word “Leifers” with a question mark written on it. That question mark may cast some doubt on whether this is a photograph of members of the Leifer family, but I recognize the young woman standing just right of center from other photographs where she’s securely identified. She’s my great-great-grandmother Louisa “Lucy” Leifer Shanower (1856-1916). So I’m confident that these people are Leifers. But other than Lucy, which Leifers are they? Well, using Lucy as an anchor, I’ve come up with an answer. My great-great-great-grandfather Frederick Leifer was a stonecutter, according to family tradition. He and his wife Catherine Easley Leifer had seven children who emigrated with their parents from Switzerland in 1854. Frederick and Catherine may have had one or two earlier children in Switzerland, but if those children existed they didn’t travel to the USA with the rest of the family. Maybe they died beforehand. In April 1854 the Leifer family sailed from Havre, France, on board the Cotton Planter. On reaching the USA, they settled in Sugar Creek, Stark County, Ohio, where Frederick and Catherine had two more children, Lucy and Callie. Frederick Leifer became a US citizen in the court of Common Pleas at Canton, Stark County, Ohio, in June 1859, and his citizenship seems to have covered the whole family. They were all living in Sugar Creek in 1860. This photograph, I believe, shows the nine US-resident children of Frederick and Catherine Leifer. Earlier I guessed that this photo was taken about 1875. Now I think that it was taken no earlier than 1880. The woman on the left is not Catherine Easley Leifer, as I’d previously thought. I think she’s Catherine’s eldest daughter, Mary Anna Leifer Klick Erb (1847-1919). Mary was born in Switzerland and died in Perry, Stark County, Ohio. Her first husband was Jacob Klick (1845-1880) and she had three children with him. Leonard Erb (1842-1892) was her second husband and they had two children. I don’t have much more information about Mary. I do know that in August 1896, after being widowed for the second time, she entertained quite a number of her relatives and friends at her home near Richville, Stark County, Ohio. Many of those relatives and friends may have been in the area because of the Roush Family reunion. For instance, I know that her sister Lucy and Lucy’s husband Benjamin Shanower, son of Mary “Polly” Roush Shanower, were then visiting. I don’t know which of the Leifer sons is which in this photo. I’m guessing the one without a beard is the youngest brother. He’s standing next to Lucy, who is the next youngest child. In the absence of any other clues, I’m going to hazard a guess that the sons are arranged in order of birth, starting with the one seated on the bottom left and going across the first row before continuing on the top left and going along the upper row. So that means the man seated on the bottom left is Frederick Leifer, the younger (1839-1904). Frederick, like all his brothers, was born in Switzerland and settled in Sugar Creek, Stark County, Ohio, with the rest of the family after they arrived in the USA. Frederick served in the US Civil War. After joining the military, he was promoted to Corporal on October 22, 1862. He was wounded at Chancellorsville, Virginia, on May 2, 1863. He was wounded again at Gettysburg, Pennsylvania, on July 1 of the same year. On May 1, 1864, he was promoted to Sergeant. He was mustered out at Charleston, Ohio. After the war Frederick married Phoebe W. Urshel (1843-1920) and they had eight children. Between 1873 and 1878 Frederick and his family moved to Kosciusko County, Indiana—following his younger brother Nicholas—where Frederick continued his occupation as a farmer. He died and is buried in Pierceton, Kosciusko County, Indiana. Second from the left on the bottom row is most probably Jacob Leifer (1842-1922), born in Zauggenried, Switzerland. It’s likely that the rest of Jacob’s brothers and sister Mary Anna were also born in Zauggenried, but Jacob’s the only one I have a confirmed birthplace for. Jacob married Catharine Ann Warstler (1839-1904). They had seven children. Jacob spent most of his life farming near Justus, Stark County, Ohio. Like his elder brother Frederick, Jacob fought in the US Civil War. Much of the information I have about Jacob seems to be related to finances. In 1897 he ran for trustee of Sugar Creek Township and reported his expenses as four cents for cigars and fifteen cents for telephone toll, the smallest expense account reported by a candidate in Stark County that year. In May 1898 Jacob sued E. J. Miller and John S. Fohl to collect five hundred dollars alleged to be due on a promissory note. I don’t know the outcome of that suit. In May 1900 Stark County paid him five dollars as relief for the poor. I don’t know whether Jacob had fallen on hard times or was between harvests and needed five bucks himself or whether he passed it on to someone else in need. If he was in need of money himself he probably got a tidy sum in 1906 when the Wheeling and Lake Erie Railroad secured a right-of-way through his land east of the Brewster, Ohio, terminal yards. Then in March 1907, several years after his wife Catherine died, Jacob seems to have sold his farm and moved to the comparatively large nearby town of Massillon, Stark County, Ohio. 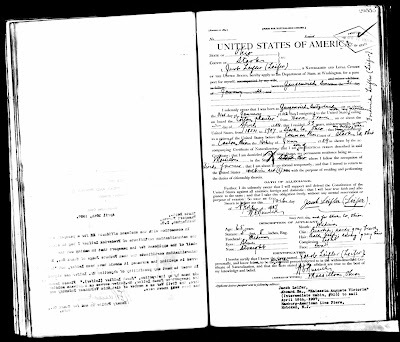 The next month, April 1907, he applied for a passport and with his son, Daniel Webster Leifer (1867-1947), sailed on April 18 for Europe on the ship Kaiserin Auguste Victoria. The primary purpose of the trip was to visit his birthplace of Zauggenried, but he and his son also saw Paris, France. They returned in May 1907 and about that time Congressman James Kennedy granted a series of pensions, including a pension of twelve dollars a month to Jacob Leifer. Jacob lived until 1922 when he died at the home of his daughter Celia Catherine Leifer Roush (1876-1948). 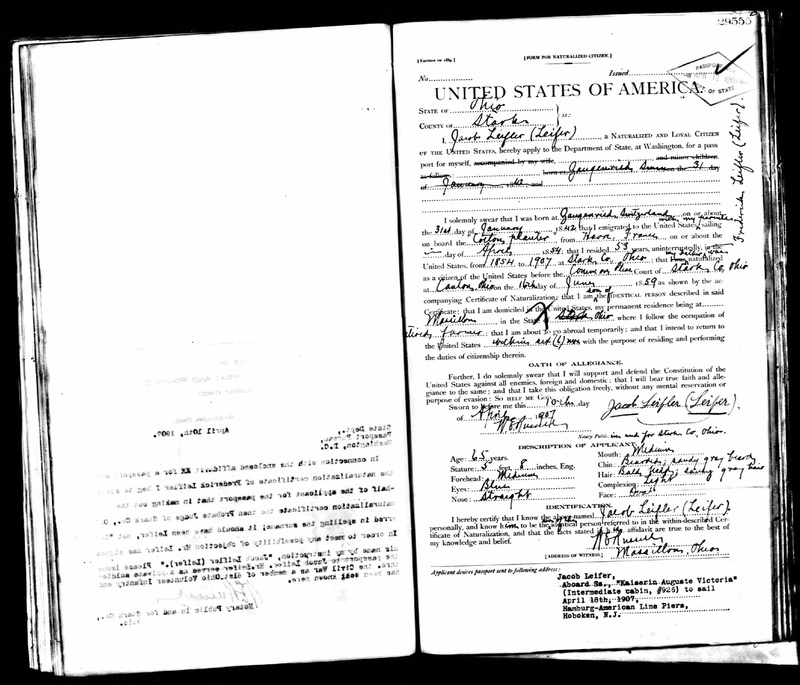 Jacob Leifer's 1907 passport application. Next is Nicholas Leifer (1844-1919), also born in Switzerland. He married twice, the first time before 1868 to Louisa, last name unknown, who died in 1882. They had one child. In 1883 Nicholas married Sarah A. Workman (1859-1945). They had three children. Nicholas was the first of the Leifer siblings to move—between 1868 and 1870—from Stark County, Ohio, to Kosciusko County, Indiana, where he was a farmer. In 1917 Nicholas and Sarah Leifer were living in Columbia City, Whitley County, Indiana, when they made a trip back to Richville, Stark County, Ohio, to attend that year’s Leifer family reunion at the home of nephew Frank Klick. In late 1918 or early 1919 Nicholas was stricken by paralysis while working on his farm east of Warsaw, Kosciusko County, Indiana. He was ill for several months before he finally passed away at the Warsaw home of his daughter, Blanche C. Leifer Lowman (1887-aft 1942). 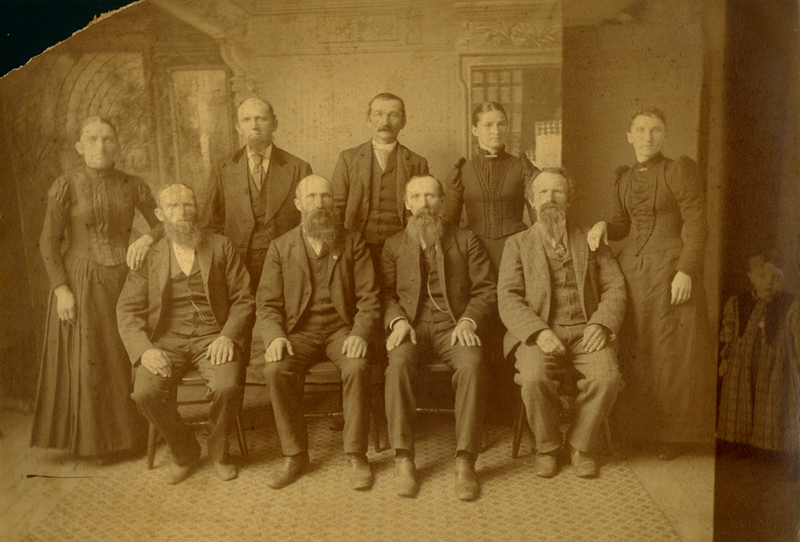 The right-most of the seated brothers is John Leifer (1846-after 1919). What information I have about John is fragmentary. He married three wives—Lettie, whose maiden name and dates of birth and death remain unknown; then Sarah Miller (about 1848-before 1900) with whom John had three children; and finally Susannah Cook (about 1860-after 1919). In 1880 John was living in Chester, Wayne County, Ohio. In 1900 he lived in Madison, Williams County, Ohio, and in 1904 in Pioneer in the same county. In 1910 he lived in Reading, Hillsdale County, Michigan, and was there through at least 1916. It’s frustrating not to know any more about John. I don’t even know when he died. The man standing on the left of the back row is Rudolph Leifer (1849-1906). He married Elnora R. “Ella” Boli (1856-1934) and they had five children, three who lived to adulthood. By 1888 Rudolph was a saddle-maker. He ran a hardware and harness store for thirty years in Richville, Stark County, Ohio. He seems to have been respected in his community and well known in business circles in Massillon and Canton, Ohio. He was elected a trustee of Sugar Creek Township at least once, in 1901, and in 1903 he was chosen as a Stark County, Ohio, Democratic delegate to the state senatorial convention. By June 1906 he was under the care of a Cleveland, Ohio, physician. He returned home by September that year where he died of liver cancer. The standing man without a beard is Benjamin “Ben” Leifer (1851-1931), the youngest of the Leifer brothers. He lived in Perry, Stark County, Ohio, and I assume he was a farmer. He married Mary Ellen Thompson (1857-1887) in November 1876. They had four children, but in 1887 Mary died of consumption. I’m not sure of Ben's ability to care for his children when Mary died. In 1893 the court declared his older brother Rudolph as guardian of Ben’s minor children, which seems to have included all of them. Then in 1898 the court ordered the sale of the real estate being held in the guardianship of the eldest child “and others.” I assume that “others” meant the rest of the children. The eldest child, also named Benjamin Leifer (1879-before 1933), led a life that seems to have contained a degree of chaos—including drinking and divorce. I’m not sure how much his mother’s early death and subsequent wardship under his Uncle Rudolph may have contributed to this, but I wouldn’t be surprised if those things were factors. I don’t know how present the senior Ben was in his children’s lives. By 1916 he’d left the farm in Perry and was living in Massillon, Stark County, Ohio. In August 1919 he hosted that year’s Leifer family reunion at his home. Louisa "Lucy" Leifer Shanower (1856-1916), my great-great-grandmother, married Benjamin Franklin Shanower (1845-1928), my great-great-grandfather, in 1879, when she was twenty-two years old. He was thirty-three and had already been married once before—to Sophia King (1841-1877)—and had four children from that marriage. Lucy and Benjamin lived on a farm in Burton, Geauga County, Ohio, and added seven children to the family, including their fourth, David Elmer Shanower (1885-1967), my great-grandfather, who I met when I was a baby. Lucy died in 1916 at the age of sixty-one and is buried in Claridon, Geauga County, Ohio. Finally we get to Carolyn “Callie” Leifer Warstler (1862-1926), the last in the row of standing adults and youngest of these Leifer siblings. In February 1885 she married Simon O. Warstler (1862-1930), first cousin once removed of his brother-in-law Jacob Leifer’s wife Catherine Warstler Leifer. Callie and Simon had two children. I base my estimation of this photograph's date on Callie's appearance. She looks pretty well full-grown, so my previous dating of this photo to about 1875--when she would have been thirteen years old--seems too early. Now I estimate the date as 1880 or later. That would make Callie at least seventeen. I think that age is more in alignment with her appearance in the photo. Callie and her husband Simon hosted the Leifer family reunion of June 1911 at the old homestead in Justus, Stark County, Ohio. Many Leifers attended. They included Callie and Simon’s son Edward and Edward’s fiancee Artha Collier, Callie’s sister Lucy and husband B. F. Shanower with their daughter Bertha from Burton, brother Jacob Leifer with his sons Piola and Daniel Webster and his daughter Celia and her husband Andrew Roush and their daughters Bernice and Florence, brother Jacob’s son Ervin Leifer with his wife Emma and their children Halvor and Muriel and Lois, brother Jacob’s daughter Clara and her husband Clem Culler and their daughter Pearl, brother Ben Leifer and his daughters Nora and Bertha, brother Rudolph Leifer’s widow Ella and their daughters Vergie Leifer Grossman and Clara with Clara’s husband Clarence James, brother Ben Lieifer’s son Walter with wife Jane and daughter Mary Elizabeth, brother Jacob Leifer’s daughter Ada with her husband Emil Class and their daughter Pauline, sister Mary Anna Leifer Erb and her children Austin Erb and Laura Erb and Frank Klick with his wife Minnie and their childen Mary and Frank Jr. The final figure in the photo is the child on the far right. Who is this child? I don't know. I can't even tell whether it's a boy or a girl. The child is wearing a dress, so modern viewers might automatically assume it's a girl, but dresses weren't unusual for young boys of the late nineteenth century to wear. The hair looks short, so that seems to indicate it's a boy, but the child might have long hair pulled back. Or a girl might have had her hair cut short for some reason, such as lice. I assume the child belongs to one of the adults in the photo. Many of the adult Leifer siblings--Frederick, Jacob, John, Mary, Rudolph, Benjamin, and Lucy--had children born in the late 1870s and early 1880s. This child could be any one of them, although I guess the child is slightly less likely to have Frederick or John as a father, since their families lived in other states than Ohio when this photo was taken. I'm sure the photo was taken in Ohio, possibly in connection with a family reunion, and Frederick's or John's children might not have come along. I doubt this child's identity can be narrowed down to a single name. Fort Rosecrans National Cemetery, west gate. The plot of Don and Amy Bartholomew is just behind the gate's left pillar. 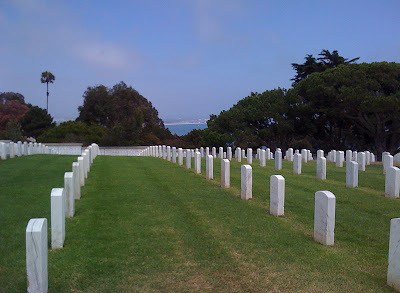 I was intrigued to find that some of my relatives have graves in Fort Rosecrans National Cemetery. It's not that I have any thrilling or funny stories to tell about these relatives--I don't. I was intrigued because Fort Rosecrans National Cemetery is in the city I call home, San Diego, California. So I took a drive out to the cemetery to find the graves of Amy Consuelo Huss Bartholomew (1890-1984) and Robert Murray Schell (1930-1992). Amy Consuelo Huss Bartholomew was my second cousin four times removed. Our common ancestors were her great-grandparents Noah Jacob Huss (1790-1843) and Mary Burkholder Huss (1789-1849), who are my five times great-grandparents. On September 1, 1912, Amy Huss married Don Clio Bartholomew (1888-1959) in Lagrange County, Indiana, the county where they both were born. Don joined the US Army and rose to the rank of Major. They lived at different times in Fort Constitution, New Hampshire; Sable, Colorado; and in the Canal Zone of Panama, where their only child, a daughter, was born in 1923. 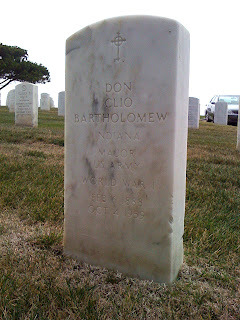 First side - Don Clio Bartholomew grave. Reverse side - Amy Consuelo Huss Bartholomew grave. When Don died in San Diego, California, in 1959, he was buried at Fort Rosecrans National Cemetery, in plot T-134. 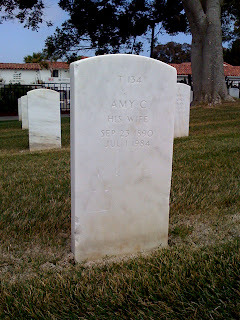 Several months before Amy died in 1984, she moved from San Diego to Carmichael, California, to be near her daughter. After she died, her ashes were returned to San Diego where they are buried in the plot with her husband Don. Her name is recorded on the reverse of their gravestone. Robert Murray Schell was my fourth cousin twice removed. We had the same common ancestors with Amy Consuelo Huss Bartholomew, Noah and Mary Huss, as I mentioned above. They were Robert Schell’s great-great-great-grandparents through both his paternal and maternal lines. The paternal line from Noah and Mary Huss to Robert Schell goes like this: Noah and Mary had a daughter Barbara Elizabeth Huss Rathbun (1816-1894). She had a son Chaplin Lorenzo Rathbun (1845-1921). He had a daughter Nina Edna Rathbun Schell (1879-1951). She had a son Harry Gaylord Schell (1904-1951). Harry's son was Robert Murray Schell. 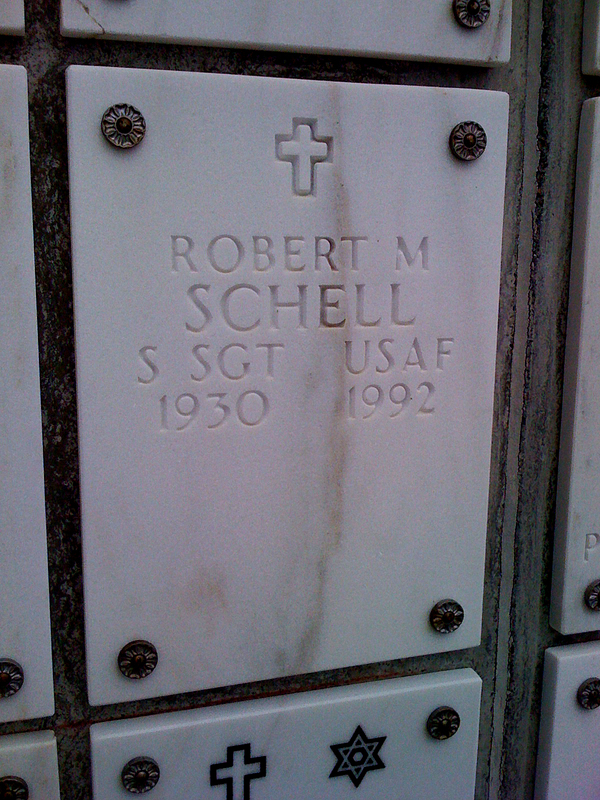 Robert Schell became a Staff Sergeant in the US Air Force. His term of service was August 10, 1947, to August 10, 1951, and he served in Korea. His ashes were interred at Fort Rosecrans National Cemetery on March 4, 1993, in plot CBA-2-112. As far as I know, his wife is still alive. She moved to Gassville, Arkansas, after Robert’s death. 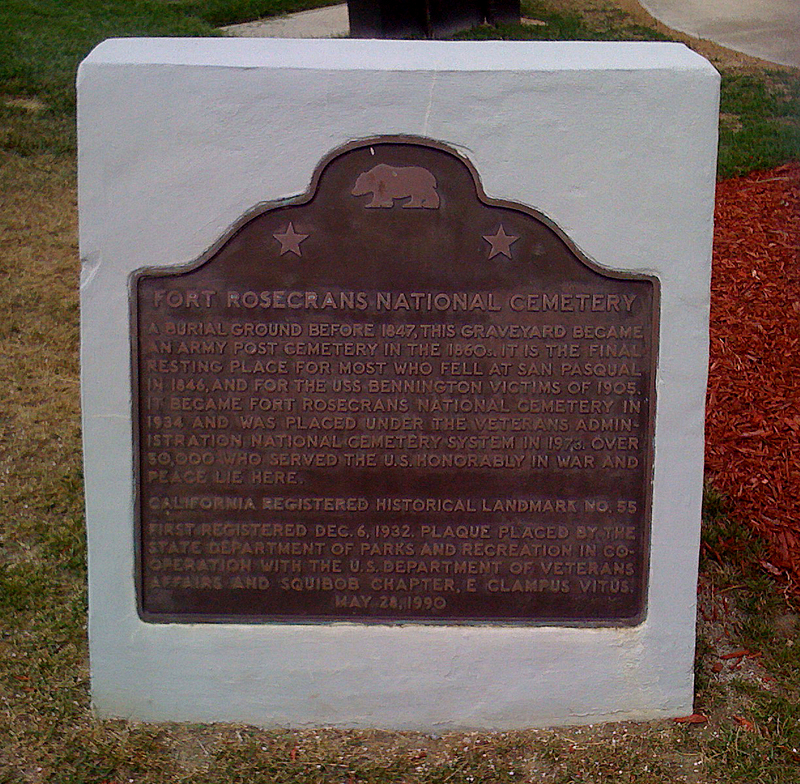 Fort Rosecrans Registered Historical Landmark plaque. Fort Rosecrans is a registered historical landmark as well as a US military cemetery. It’s worth visiting just for the views, even if you don’t have any interest in the graves. 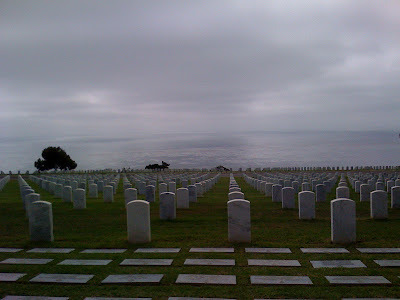 The cemetery straddles the ridge of Point Loma, which encompasses the north side of San Diego Bay and sticks out into the Pacific Ocean. The road divides the cemetery into an eastern side and a western side. In the center of this photo, between the trees, lies the historic red-roofed Victorian resort hotel, the Hotel Del Coronado, on Coronado Island. The graves of Robert Schell and the Bartholomews are on the western side of the cemetery. The Bartholomews’ gravestone is just inside the western gate to the left of the entrance drive, the fourth row from the cemetery wall, the fifth stone in from the drive. Although they’re on the western side of Point Loma, the hill curves so that their stone actually faces east, toward North Island, the bay, and downtown San Diego. 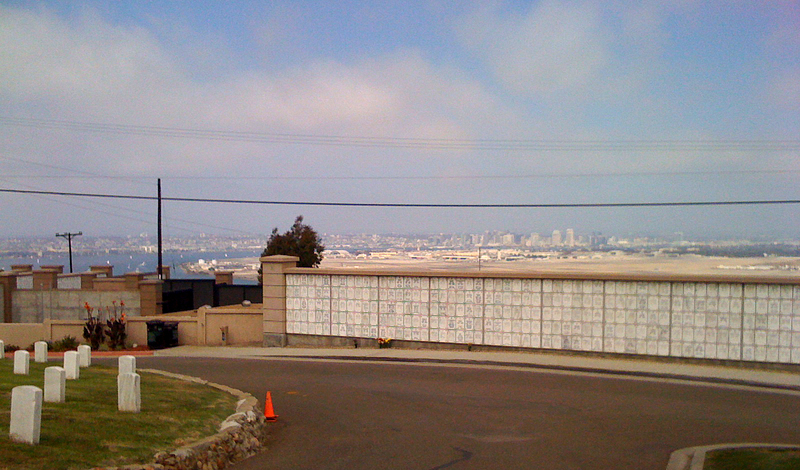 Looking east from Fort Rosecrans National Cemetery toward North Island, San Diego Bay, and downtown San Diego. 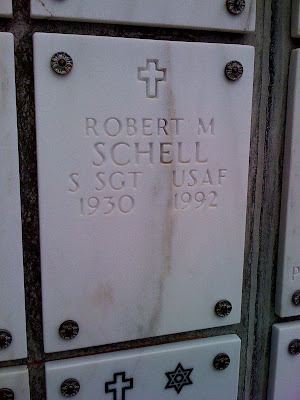 Robert Schell’s grave is within the cemetery wall high on the western slope. It commands a spectacular view of the Pacific Ocean. 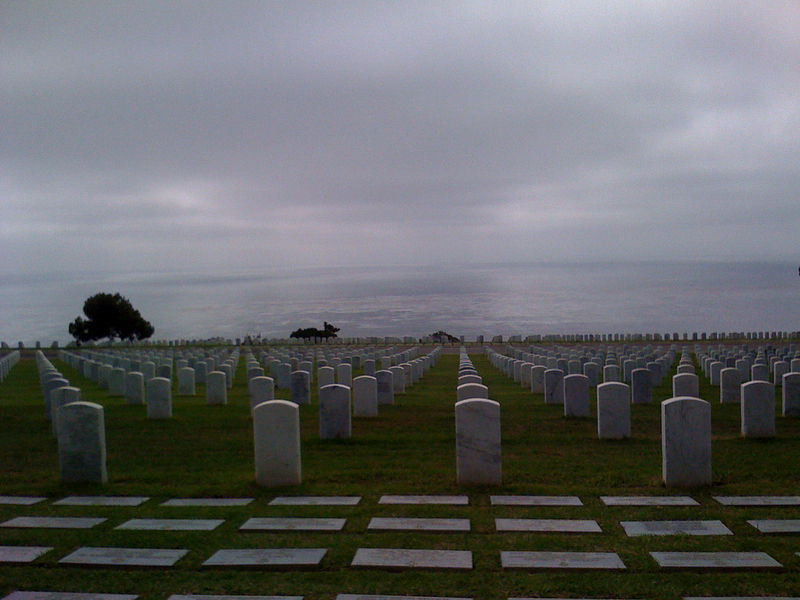 Looking west from Fort Rosecrans National Cemetery to the Pacific Ocean. I took all these photos on the same day, but the sky over San Diego to the east was mostly clear, while the sky over the Pacific was overcast. Donald Thomas Shanower with a stylish pompadour in 1947. My third cousin twice removed Donald Thomas “Don” Shanower (born 1921) has been involved in theater most of his life. The first plays I know that he acted in were The Gent and Auf Wiedersehen, two one-acts presented July 21, 1939, at Trinity Reformed Church in Canton, Stark County, Ohio, when Don was seventeen years old. I suspect that this wasn’t Don’s first foray onto the stage, since his father, Merl Frederic Shanower (1893-1949), was active in Trinity Church and had organized a Sunday School orchestra there two years before, in 1937. After high school Don earned a bachelor’s degree at Kent State University in Kent, Ohio. He fought in World War II and was awarded a Purple Heart for being wounded in Belgium in 1945. 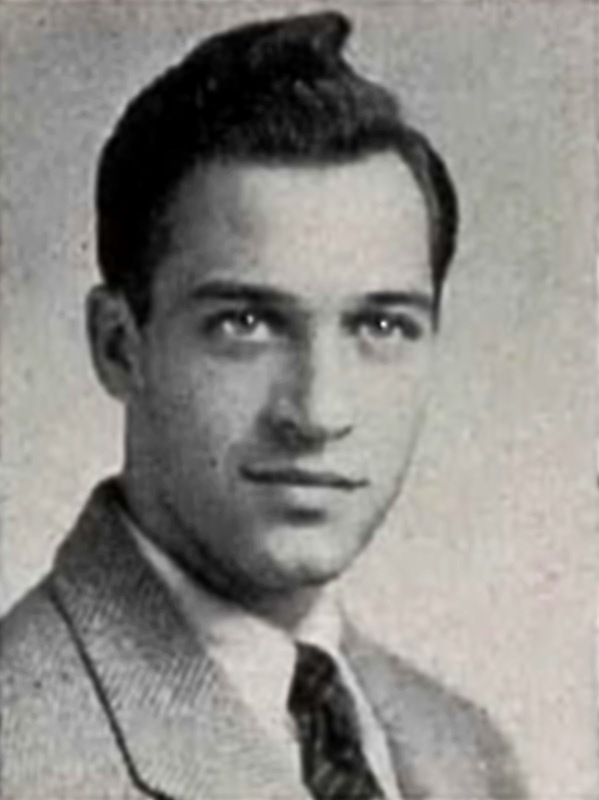 In the late 1940s he returned to Kent State University as a graduate student and earned his master’s degree. While a grad student Don acted and directed for KSU’s University Theater and held office in Alpha Psi Omega, the national dramatics fraternity. 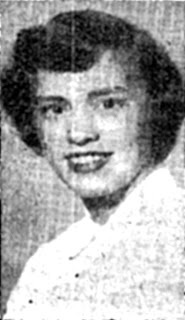 In 1948, when Kent State teamed up with Hiram College to present plays on an old-fashioned showboat on the Ohio River, Don met Hiram student Patricia Ann Gibbs (born 1928). They married in 1951 while Don was a member of the department of speech at the College of Wooster. Patricia Ann Gibbs Shanower, 1951. In 1955 Don arrived on the campus of North Central College in Naperville, Illinois, where he joined the department of speech. He was in charge of the theater program at North Central until his retirement in 1986. In 1966 Don directed his students in a production of a new musical Bligh Me with book and lyrics by Robert E. Lewis, who wrote scripts for such television shows as The Twilight Zone and Alfred Hitchcock Presents. The music was composed by John M. Danyluk. Hopes were high for Bligh Me, based on the historical Bounty mutiny, to reach Broadway. Virtually all of Naperville was excited to see the premiere on March 25, 1966, at North Central’s Pfeiffer Memorial Hall. Don Shanower, right, the lead in Accent on Youth, Kent State University, 1948. Don, standing in the back of the house, noticed a problem in row G. He and Dr. Glenn Wolf carried the woman out into the lobby, believing she’d fainted. In the lobby, however, they discovered instead that she was dead. They summoned an ambulance, but they couldn’t just leave the body lying on the lobby floor while they waited for the ambulance to arrive. If the body lay unmoved for too long, someone would notice. They didn't want the audience to grow alarmed. For lack of any other space, they carried the body into the cloakroom. It remained there until the ambulance arrived some time later—during the second act (according to Haunted Naperville) of a show that ran nearly four hours (according to a report in the Brookfield [Illinois] Citizen). The ambulance took the body away, but the spirit of the woman who died during her grand-nephew’s show still haunts the theater on the North Central campus. Or so the story goes. She’s known as the Lady in White, and they say every once in a while she appears in seat G-42 to applaud enthusiastically during performances. Don claims that he’s never seen the Lady in White, but he knows how much the students enjoy the idea of a theater ghost. Me and Don Shanower, October 2011. The story of the Lady in White was recounted in the book I quoted from above, Haunted Naperville by Diane A. Ladley. Her version of the story, which starts on page 101, does its best to milk as much drama and spookiness as possible from the event. It gets a few details wrong, but it’s correct overall. I ran across a comment on Haunted Naperville on the website of Powell’s Books, the huge and excellent bookstore in Portland, Oregon. In her comment, Diane Lewis-Bridge, daughter of Bligh Me playwright Bob Lewis, takes great exception to the incorrect facts in Diane Ladley’s version of the story. But the commenter gets a fact wrong herself when she says that Don Shanower had nothing to do with the production of Bligh Me. Don was the show’s director and was as delighted as his students to be working on the world premiere of a musical that was possibly bound for Broadway. According to Don’s wife Pat Shanower, Haunted Naperville author Diane Ladley was occasionally associated with the Summer Place, a summer theater Don founded in 1967. She should have gotten the Lady in White facts right for her book. But when Diane Lewis-Bridge’s comment assumes “the rest of the book is a total fabrication,” I find that reaction a bit over the top. Bligh Me never made it to Broadway, but Naperville is grateful for Don Shanower’s legacy to their community. 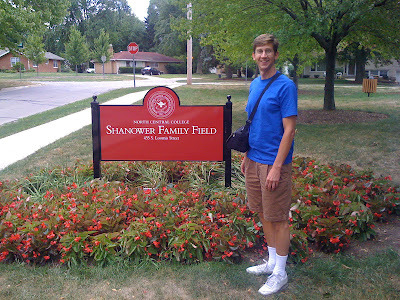 In April 2002 the Shanower Family Softball Field was dedicated on the North Central College Campus to honor Don Shanower, professor emeritus of speech communication and theater, and his family. The Summer Place Theater, which Don founded, is still in operation. And if rumor has it right, the Lady in White, the single audience fatality in all Don’s years of theater directing, continues to haunt North Central’s Pfieffer Hall. 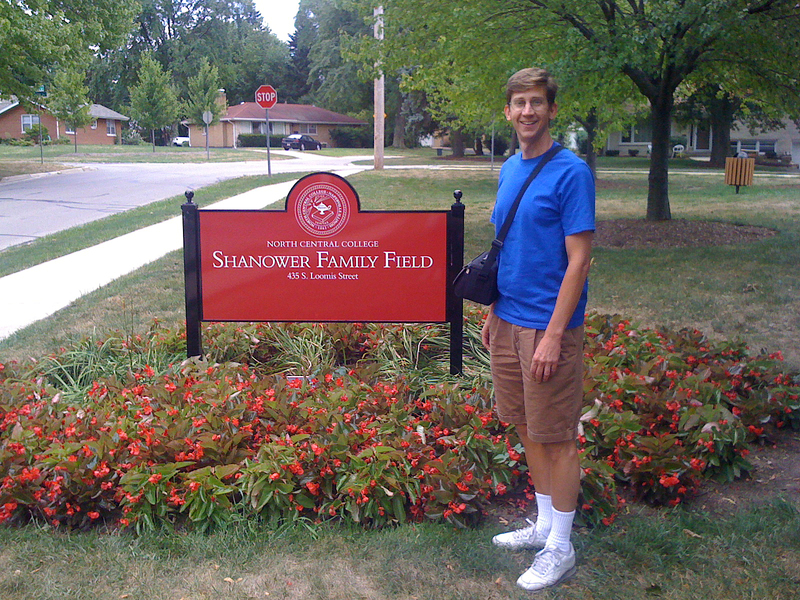 I visit Shanower Family Field at North Central College in Naperville, Illinois, August 2012. Homer Floyd Woodland (1898-1959) lived a life marked by chaos and change. He was not one of my blood relatives, but two of his four wives were. Homer's first wife was the sister of my great-grandmother. Homer's second wife was the sister of my great-grandfather. Researching their family lines was how I first learned of Homer. The secrets of his fractured life still reverberate down the generations. Ellis Doty and Alta Lucinda Flowers Doty Woodland. Homer Woodland’s mother was Alta Lucinda Flowers (1870-1929). Alta was clearly not my blood relative, since her son Homer wasn’t. But I have a connection by marriage to Alta separate from my connections to Homer. Alta’s first husband was Ellis Doty (1861-1895). Ellis Doty's fourth cousin three times removed was Aaron Doty (1807-1843). Aaron Doty married Polly Grandy (abt 1805-1838). Polly was my five times great-aunt. So that’s my connection to Alta. The common ancestor of both Ellis Doty and Aaron Doty was Edward Doty (1599-1655), passenger on the ship Mayflower. Edward Doty was a six times great-grandfather of Ellis Doty and he was a great-great-grandfather of Aaron Doty. During the Mayflower's Atlantic crossing Edward Doty was a servant of Stephen Hopkins (abt 1580-1644), who also happens to be connected to me by marriage. 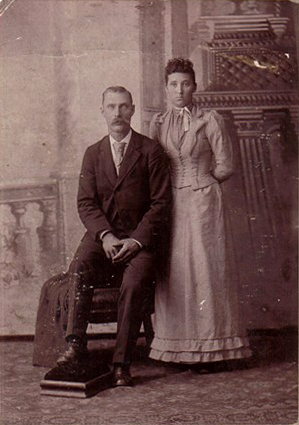 After the death of Alta's first husband Ellis, she married William Henry Woodland (1866-1931) in 1897. According to Woodland family stories William's relationship with Alta was very violent. Nevertheless, William and Alta had six children—Homer Floyd Woodland was their first—and remained together until Alta’s death in 1929. William died of dropsy two years later. Alta and William are both buried in Evergreen Cemetery in Painesville, Lake County, Ohio, where so many of my relatives are buried. Homer Floyd Woodland was born on September 27, 1898, in Madison County, Ohio—I think. Different sources report different locations for his birth. Censuses report that he was born in the township of Pike in Madison County. One of his marriage licenses says he was born in Rosedale, an unicorporated community in Pike Township. The evidence seems to weigh most heavily toward Rosedale as Homer’s birthplace. Another source reports the community of Lafayette in Madison County's nearby Deer Creek Township as Homer’s birthplace. Yet another source claims the village of Perry in Lake County, Ohio. But I suspect these are incorrect. Homer was born into a household that already had one child, the daughter of Alta and her first husband Ellis, Elsie Ellen Doty Slee (1894-1974). Elsie Doty was a half-sister to Homer Woodland and they spent parts of their childhoods together. Homer’s five younger brothers and sisters were born over the next twenty years. Homer was married to his first wife by the time his youngest sister Catherine E. Woodland Skiba (1918-1996) was born. Despite this difference in age, as adults Homer and Catherine spent time together. Yet Catherine’s obituary has no mention of Homer, although it mentions the rest of their siblings. Is this omission evidence for Homer’s fragmented life or a simple oversight? 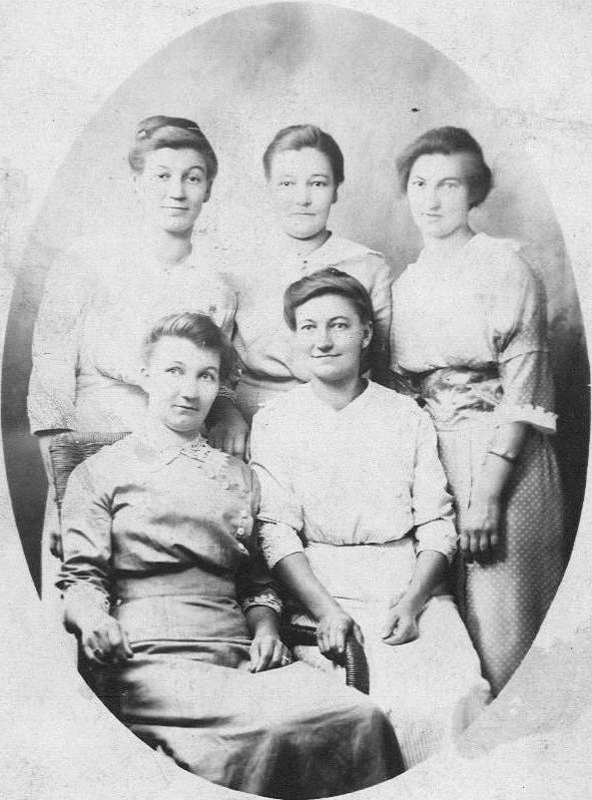 The five Salo sisters. Ida Justiina Salo Woodland is on the top right. My great-grandmother, Edla "Edna" Salo Hietanen, is seated at lower left. On June 30, 1917, Homer enlisted in the National Guard. Less than two weeks later he married Ida Justiina Salo (1894-1967) in Lake County, Ohio. Homer was still a minor at nineteen years old and his father had to register his consent to the marriage. 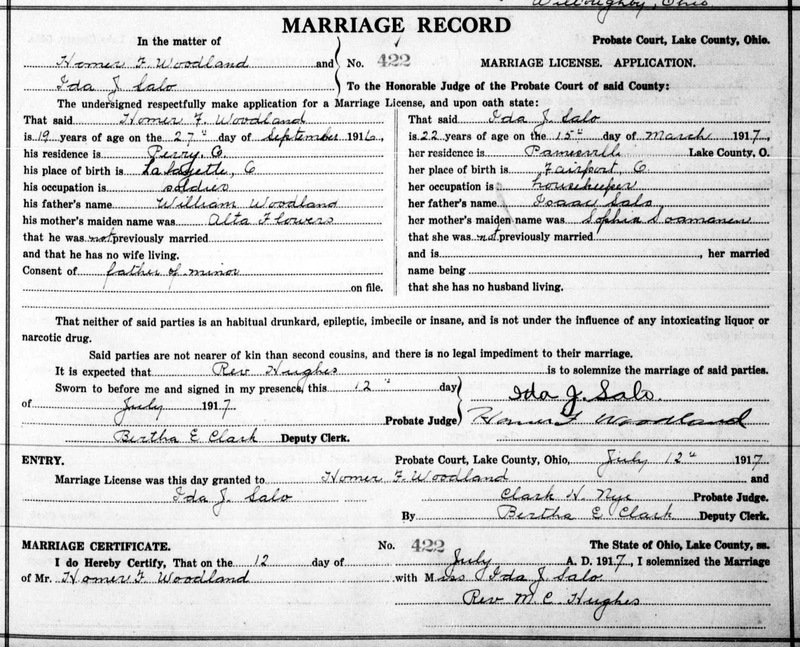 Homer Woodland and Ida J. Salo Marriage License, 1917. Homer and Ida’s daughter Dorothy Helmi Woodland Gray (1917-1992) was born less than five months after their marriage, so it looks like Ida conceived out of wedlock. Knowing my family history in similar cases, I think Homer and Ida were probably pressured by family members to marry in order to save face within the community of Fairport Harbor, Lake County, Ohio, Ida’s birthplace. The Helmi portion of Dorothy's name probably came from Ida’s next older sister Helmi Sofia Salo Lahti (1890-1961). One family researcher records that Homer and Ida also had a son, Dennis Woodland. But I can find no confirmation of Dennis’s existence. 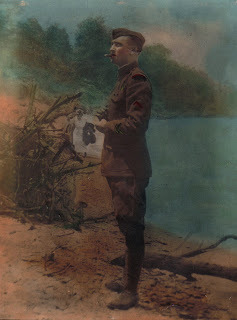 Homer in uniform, Cleveland lakefront, 1917. Homer fought in World War I with the American Expeditionary Forces in France. He was a private first class in the 166th Infantry, 42nd Division. He fought in the Champagne-Marne campaign, July 15 to 18, 1918. During the Aisne-Marne campaign of July 18 to August 6, 1918, he was slightly wounded. Then on September 21, 1918, he was severely wounded. He was discharged honorably on February 25, 1919, with a fifteen percent disability. While Homer was overseas something prompted Ida to send him a “Dear John” letter, and on July 15, 1921, they were divorced. Within a few years Ida married her second husband, Lawrence E. Armstrong (1898-1976). Ida and Homer’s daughter Dorothy lived with the Armstrongs and took their last name as her own. Ida and Lawrence had two children, Jean Armstrong Gilcrest (born abt 1927) and Robert F. Armstrong (1929-1998). In 1942 Ida and Homer’s daughter Dorothy married Delmar Anson Gray (1918-1944). They had a son in 1943. Delmar died in battle while serving as first Lieutenant with the US Army Air Corps 385 Bomb Group, 551 Bomb Squadron in World War II, leaving Dorothy a widow. She died decades later in 1992. Her son seems to still be living. 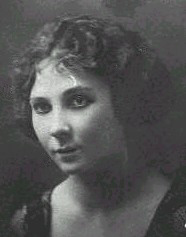 Cecelia F. "Selfa" "Celia" Hietanen Woodland (1902-1925). Homer and Celia had no children. At age twenty-three Celia died of pulmonary tuberculosis, April 15, 1925. Although Homer and Celia made their home in Cleveland, Ohio, Celia died at the home of her mother in Painesville, Ohio. Two days later she was buried in Painesville's Evergreen Cemetery. According to the account of her funeral most of her living siblings and their spouses attended, along with other relatives. But there’s no mention of her husband Homer, her in-laws who were both still alive, or any of Homer’s brothers or sisters, most of whom lived in Lake County or close to it. Why didn't any of Homer's family attend his wife's funeral? Were Homer and Celia estranged by the time of her death? It seems likely. Homer Woodland's race car in the 1920s. Incidentally, Homer’s occupation was listed as “Driver” in city directories of both Columbus, Ohio, in 1914 and Cleveland in 1925. But what did “Driver” actually mean? 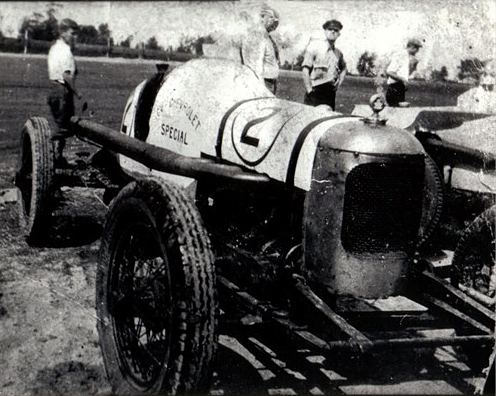 The race car that Homer owned in the 1920s might be a clue. But he was also a bus driver in 1928. Fayme E. Smith (1898-1965) was Homer’s third wife, a daughter of European immigrants Peter N. Smith (1860-?) and Victoria Sonnie Smith (1867-?). Like Homer, Fayme had been previously married. On December 31, 1919, Fayme wed Robert D. Britt (abt 1898-1965), but they were divorced by 1926 when Marceau Carr became Robert's second wife. Robert and Fayme may have been divorced as early as 1920 when Fayme was living with her brother William E. Smith and his family in Cleveland. In 1921 she was working as a stenographer and listed under her own name, not a husband’s, in the Cleveland city directory. 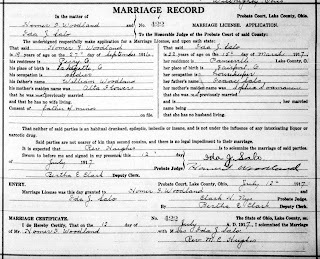 Homer Woodland and Fayme Smith Marriage License, 1928. Notice it only records one of Homer's two previous marriages, the one to Celia, since the wife is deceased. Is this an oversight or more evidence for Homer keeping secrets? Homer married Fayme on October 13, 1928. They had no children. By 1930 Homer was living as a roomer, evidently separated from Fayme, but still married to her. Fayme was living without Homer in the household of another of her brothers, Walter J. Smith. By the end of 1930 they were divorced. In 1940 Fayme was living, still single, in the household of yet another of her siblings, her sister Amelia H. Smith Frey. I don't think she ever married again before her death on January 8, 1965. Helen Gertrude Croyle (1908-2008) was Homer’s fourth wife. They married on December 24, 1930, in Helen’s hometown of Kittanning, Armstrong County, Pennsylvania. Homer and Helen lived in Cleveland, Ohio, and had two children, a son Dale Edward Woodland (1932-2010) and a daughter who’s still living. Whatever problems had led to Homer’s previous divorces didn’t seem to adversely affect his marriage to Helen. They remained together until Homer’s death on November 8, 1959. About 2005 Helen left Ohio for South Carolina where her daughter and son-in-law live. She passed away on August 6, 2008, at the age of ninety-nine. 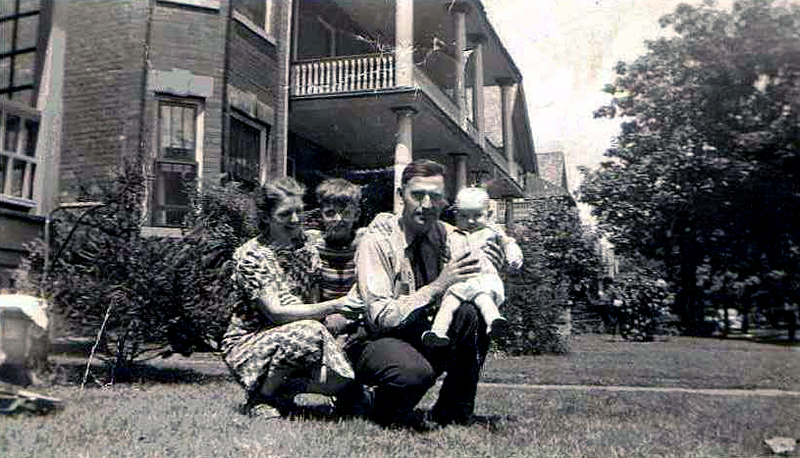 Helen Gertrude Croyle Woodland, Dale Edward Woodland, Homer Floyd Woodland, and the daughter born to Helen and Homer, at home in Cleveland, Ohio, 1941. After Homer died, Helen shocked her daughter with the news that Helen had been Homer’s fourth wife. I recently contacted that same daughter and shocked her again by asking about her half-siblings Dorothy Woodland Gray and Dennis Woodland. She had heard only a vague mention of a single half-sibling and now assumes that meant Dorothy. Dennis, if he existed, remains elusive. Dennis may instead be Dorothy's son, not her brother. Homer F. Woodland initially captured my interest when I realized he’d married two of my great-great-aunts, already sisters-in-law when each married him. But in digging deeper, I found Homer and his multiple families even more interesting. He was clearly a man who kept secrets, even from close family members, a habit, I suspect, that may have contributed to his divorces. Even his daughter could be shocked by newly revealed information nearly half a century after his death. That makes me wonder what secrets Homer may have left that have yet to be uncovered.